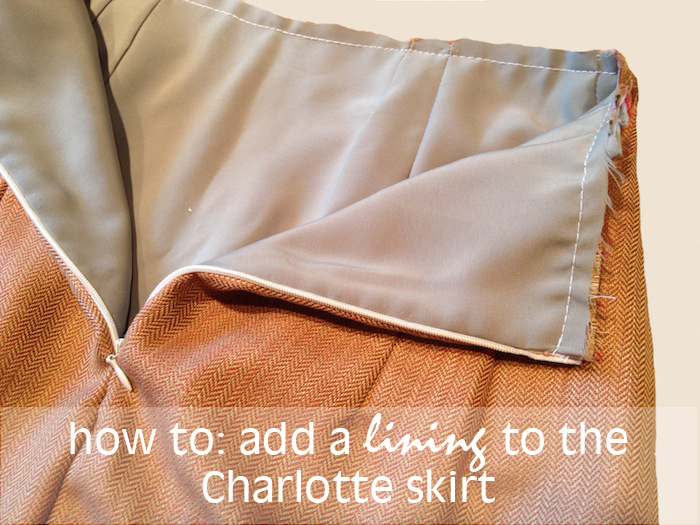 Today sewalongers, we have for you a bonus post - how to add a lining to your Charlotte skirt! Before we get started, you can find the previous Charlotte skirt sewalong posts here. a metre of a lightweight, slippery fabric such as polycotton or sateen. Anti-static is best. Turn the lining inside out and slip it inside the main skirt (the skirt's shell). The two wrong sides should be facing each other hiding all seams, leaving only the right sides showing. 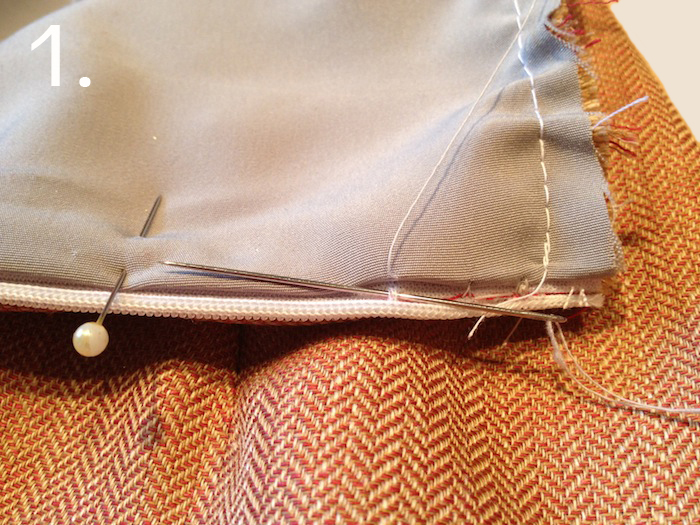 Match up the side seams, darts and centre back and pin the lining to the shell all along the waistline. Machine stitch into place, leaving just 3/8" seam allowance as opposed to the usual 5/8" so as not to leave unnecessarily visible stitches once the waistband has been attached. Now, and for the cleanest of finishes, we're going to blind stitch the opening at the centre back of the lining to the zipper. Pin the back opening of the lining to the zipper. Thread up your hand sewing needle. 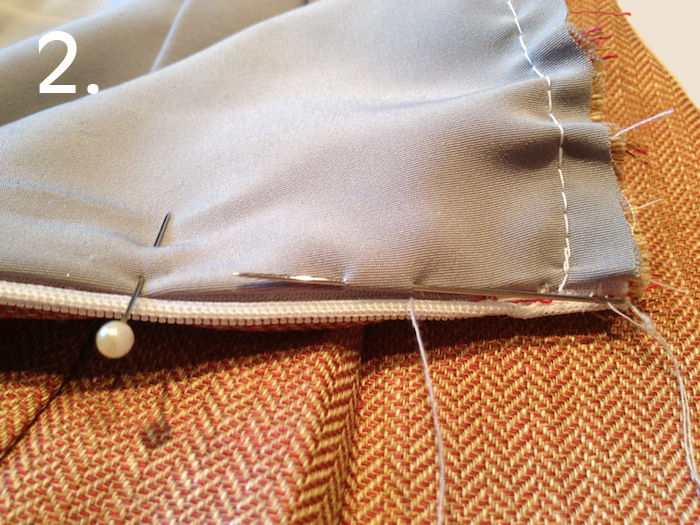 Starting at the top of the (open) zipper, insert your needle into the fabric of the zipper, picking up just a few strands and coming right out again (shown in fig.1 below). Don't get too close to the zipper teeth, or you might have a problem getting your zipper back up. Now insert your needle into the lining fabric directly above your current stitch. Using the pressed fold as a guide, slide your needle along a centimetre or so inside the fold and then come out again (see fig.2 below). Repeat fig.1 directly below the point your needle just came out. And so on. Continue this blind stitching down to the point at which the zipper ends, and back up the other side. Securely knot off your stitching and make sure that the zipper still goes up and down smoothly. All done and slinkified! Now all we have left to do is attach our waistbands and hem our skirts! If you have some time this weekend and fancy skipping ahead, you can refer to our tutorial, The Perfect Waistband. Finished already?? You can start emailing us pictures of your Charlotte skirts for our round-up Sew & Tell post to: elisalex@byhandlondon.com - please send us high-res images, links to your blog or other social media, plus anything else you'd like to add - maybe your highlights of the sewalong, favourite details on your skirt, ways in which you might do it differently next time round. We'll do our very best to include everyone. That's it from us for now - have a wonderful weekend folks! Thank you! I am sewing something that is lined and underlined for the first time! I am needing a lot of help and this was great! If you are making a skirt with a ruffle, does it change the treatment of the lining at all? That is, do you attach the lining to the ruffle in any way? Or hem it to where the skirt and ruffle meet? Thanks for your help! You got it. No need for fancy treatment – just hem the lining so it hits the point where the skirt meets the ruffle or just slightly above. Hope this helps! Thank you for this post! I put the lining together last night and was debating hand sewing the finish since I never hand sew. Well I have to say I pretty much cursed the whole first side and some unpicking will need to be done. But by the second side I finally found a rhythm and with the full moon just rising here and some jazz playing I’m actually enjoying it. It’s far from perfect but I’m very happy to be learning a new skill! Hi, thanks for this. In my head it seemed fairly straightforward, but I wasn’t sure about the zip part. Quick question – I am really slim hipped so have taken the main shell in quite a bit at the sides, but that fabric has some stretch so I’ve left relatively little ease. 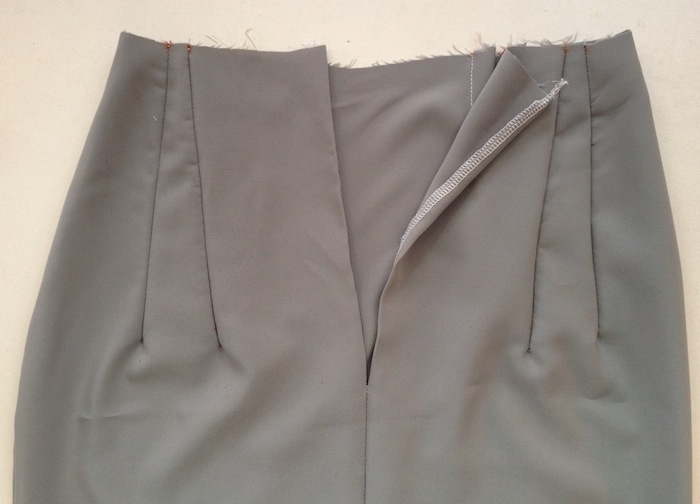 My lining obviously doesn’t have stretch – should I leave a bit more ease in the lining for comfort when wearing? I think it’s a question of millimetres here… if you leave extra ease in the lining you risk it feeling bulky (or worse – looking bulky!) in your shell. I would cut it pretty much exactly as the shell, then sew the side and back seams with just a smidge less seam allowance – but literally no more than 2-3mm less seam allowance at each seam, which would give you 6-9mm ease all around, without feeling like your lining is bigger than the shell. Hope this helps! Thanks for adding this lining tute. It’s really helpful. I’d better get a move on this weekend as I’m a bit behind. Don’t worry – the next 2 posts are the easiest and quickest bits spread out over a week, and then’ll have a good few days after that before the round up! Can’t wait to see what you’ve made!